"This must be the greatest work of Indian architecture." I was convinced while walking inside of a extensive Jaina temple with excitement. This temple, dedicated to the first Tirthankara Adinatha, appeared all of a sudden at Ranakpur, which is a place located in the depths of the mountains, neither a city nor a village. It took me several changes of trains and buses from Mount Abu to get to the temple. It was the time when my three-month journey in India was drawing to a close. In this architectural pilgrimage starting from East India, I had been often overwhelmed by a lot of great works of Hindu and Islamic architecture in Northern and Southern India. And yet, it was this temple that struck me the most and became the highlight of my long journey. I felt it very strange that a masterpiece like this stood on such a remote and inconvenient mountain, not in a big city or famous tourist site. At that time, there was no tourist bungalow at Ranakpur. Besides this large temple and a few small ones, there was only a pilgrimage accommodation facility called "dharmashala." I visited this temple three times with nine year intervals between each visit. Every time I go there, I cannot but get a fresh impression. It is a blissful combination of architecture, sculpture and crafts, sequential space abounding in variety, immaculacy of white all over, continuing halls covered by high-raised domical ceilings full of extremely minute carvings, that reminds us of a sense of the "Pure Land." The beauty of this temple is indeed beyond description. Ever since my first visit, the more I learned about the background of this temple, the more I was fascinated by it. PLAN 1. ADINATHA TEMPLE, RANAKPUR, 15th century. The central main shrine is called "Mula-Prasada", the interior of which is "Garbagriha" (sanctum), and its main statue is "Mulanayaka". For a Chaturmukha (four-faced) shrine, unlike the temples of Mt. Abu, there are no "Gudha-mandapa" (closed hall) or "Trika-mandapas" (vestibule), but four "Ranga-mandapas" ( A, assembly hall) in front of four portals of the main shrine. Each Ranga-mandapa is connected with a three storyed "Meghanada-mandapa" ( B, high hall) in front. Having four "Mahadara-prasada" (two-faced-shrine) diagonally in four directions of the main shrine, the temple type is "Panchayatana" (five-shrined-type). In addition to this, there are two "Bhadra-prasada" east and west sides, making the total composition much more intricate. A line of "Deva-kulika" (small shrine) along "Bhamati" (cloister) surround the whole complex. All these shrines hold a statue of Tirthankara or Jina (four in Chaturmukha, two in Mahadara-prasada), there are more than 100 statues in total. The temple is very large. It stands on a basement of 60m x 62m (*1) , which looks like a stronghold. On the top of a flight of stairs at the central entrance, there is a three-storied "Balanaka" (entrance hall), which has a domed roof. Its entrance door is rather small in order to defend itself from incursion, as I have explained in the previous chapter. Passing through the portals and walking up a dark staircase, there suddenly appears a bright and magnificent space, and the splendor takes our breath away. A large number of columns are carved elaborately, and it is said that no two pillars are alike in design. At a space that penetrates through two to three stories, various heights of domes are placed, and their ceilings have sculptures that are unbelievably intricate. Light is abundantly coming inside through gaps between ceilings and from courtyards, highlighting the intertwined spaces and fine carvings all around. The splendor of the space is so pure as the entire temple from the floors to the ceilings is made of white marble. It also might be described as the realization of the Pure Land. While walking around inside the temple, there are so many various vistas that it is almost impossible to take enough pictures. It is as if J. S. Bach's "The Art of Fugue" is crystallized into the materials. I have never experienced such a luxurious space at any other place in India. To name the works of architecture that provide us with the closest impression to this temple, it would be Ennis House and Imperial Hotel (in Japan), which were designed by Frank Lloyd Wright in his middle period. These two buildings are filled with unique concrete blocks, terra cottas, and tuff stones that are elaborately carved. Assuming the repetitions and variations of these elements as a "basso continuo," these works of architecture produced a kind of unrealistic beauty in their space composition, floating and intertwining intricately. At the temple of Ranakpur, since there are scarcely any walls that separate inside and outside except the one that surrounds the whole temple, the fluidity of space here is much more conspicuous. Depaka, who designed this temple, must have been a genius in architecture. It is hard to believe that such a huge edifice with great unification was constructed by merely combining arts of craftsmen. Without a firm concept and aesthetic sense, this kind of masterpiece would not have been realized. This architectural work seems to be underestimated by art historians. One reason for this would be that each sculpture looks inferior when compared to Hindu ones. However, in the Jaina architecture, sculpture is not supposed to insist on its value in itself. Instead, all the engravings serve for the entire architectural spaces, without going beyond the frames of architectural elements. (This aspect also reminds us of the works of Frank Lloyd Wright.) The other reason would be that most of its architectural elements including "shikhara" have been developed in Hindu architecture, and this temple in itself does not come up with anything unique. It is true that these are the weak points of this temple. However, the unique value attained by this Jaina temple resides in its "integration." To explain this point, though somewhat subjective, I will classify architecture into three categories. First of all, it is the "Sculptural Architecture." Perhaps the essence of Indian architecture like medieval Hindu temples lies in sculpture. This type of architecture often reveals that the whole building itself is a piece of sculptural work, not to mention the abundance of carvings in detail. It could also be called a "Massive Architecture." Secondly, it is the "Membranous Architecture," which is quite contrary to the previous. It places emphasis on the covering or enclosure of interior space rather than external sculpture like features. This type of architecture is represented by Islamic architecture in the Middle East. There are a lot of examples that even important buildings do not have conspicuous facades, getting easily buried in the urban fabrics, but once entering inside, there appear wonderful interior spaces. Thirdly, it is the "Framework Architecture." It is enough to recall Japanese architecture and other wooden or trabeated buildings. It lacks both sculpturesque appearance and modernistic space concept. The attractiveness of this type of architecture exists in the undetermined space and a framework composition above. Their interior space and exterior space are continuous without clear distinction. Thus every building could be classified into these three kinds of architecture. When we observe Adinatha temple at Ranakpur from this perspective, we will realize that these three categories of architecture are integrated into this single temple. Contrary to most Hindu temples that have majestic exteriors but often let us down by their poor interior space, this Adinatha temple has a wonderful succession of exquisite interior spaces. While the Delwara temples at Mt. Abu do not have as attractive external appearance as their interior space, this temple also has the sculptural beauty at its exterior with the shikaras above the shrines. Moreover, even though the entire structure of Adinatha temple is made of stone, it is mainly a trabeated construction. (It clearly indicates that Indian architecture has its origin in wooden buildings). The structure is based on the framework of posts and beams, not on walls and arches. (Its domes are also not Islamic, but Indian corbelled domes in the same way as at Mt. Abu.) Consequently, the synthesis of these three kinds of architecture sublimated this temple to the level that no other Hindu buildings had achieved. What enabled Jaina architecture to attain such integration? It was nothing else but the "Chaturmukha" (four faced) shrine form, which we have so far observed many times. If we compare in plan the central part of Adhinatha temple at Ranakpur to that of the Kharatara temple at Mt. Abu (see chapter 1), which is the only temple that has a different form in the Delwara temples there, we will come to know that these two temple plans are quite similar. The central shrines of these temples are opened to four directions, and in front of each side, there is a "mandapa" (hall) covered by a domical ceiling. Incidentally, the basic form of a Hindu temple is [garbhagriha + mandapa]. Since the garbhagriha (sanctum) always has only one portal at its front side, it is quite unlikely that it has four mandapas at its four sides. The garbhagriha at Hindu temples means the "house of God" (*2) and accordingly it should be locked securely as a human residence. Meals and oil lamps are served to a statue of God during daytime and the door is closed at night in order for God to sleep. which is open to the four directions and takes either round plan or square plan. On the other hand, a Jaina temple is not a house of God, but a place where a "Tirthankara" (Jina) gives teachings. It is called "Samavasarana," and the doctrine of Jina should be preached in all directions. What is characteristic about the form of Jaina images is that four statues of Tirthankaras are often combined back to back with each other, in either standing or sitting posture. It is called "Chaumukh" or " Chaturmukha" (four faced) image. If a temple is dedicated to this chaturmukha image, its garbhagriha is also opened to all four directions, thus provides mandapa, which represent a place of both worship and teaching, in front of each side. It is considered that they had built chaturmukha shrines since ancient times, as Jaina chaturmukha image of the 3rd century has been excavated in Mathura. However, these ancient shrines no longer exist today. The mainstream of the style of Jaina temples was [garbhagriha + mandapa], which Jainas had modeled after Hindu temples. From the medieval period, they gradually developed their original "Four faced open form" in the temple design. As mentioned above, since Hindu temples could not extend their composition in four directions, they increased the number of shrines when they wanted to enlarge its scale. For instance, the huge Lingaraja temple in Bhubaneshwar and the Jagannatha temple in Puri added two large mandapas in front of the basic edifice of [garbhagriha + mandapa], and placed them in a line. The other method was to build four small shrines at four opposite angles of vimana (main shrine). This complex is called "Pancha-yatana" or Five-shrined-type. This quincunx composition was applied not only to Hindu temples but also Buddhist and Jaina ones. In fact, the Adhinatha temple at Ranakpur is also a kind of Pancha-yatana-type. In this case, the shrines at four opposite angles take a form of "two-faced-shrine". Furthermore, on both the north and south ends, there are four "side shrines," and eighty-six small shrines surround its periphery, and thus completing the entire temple. What makes a difference in this temple from Hindu Pancha-yatana is quite similar to that in the development of the temples on Mt. Abu. In the latter temples, they made a "Ranga mandapa" (open-type hall) in front of "Mulaprasada" (central shrine), and connected it with surrounding cloisters, which resulted in making the whole temple a continuous interior space. Likewise at Ranakpur, each mandapa, which is covered by a domical ceiling, ties every part of the temple together into a continuous interior space with circularity, including several courtyards. This temple, so to speak, is a great integrity of all the elements of traditional Indian architecture, and brought it to an extremely high level completion. A record tells that a large temple of "Chaturmukha" form, which is said to be the direct model of the temple at Ranakpur, had existed in Siddhapura (*3) and was called "Raja Vihara" (Royal Monastery). Unfortunately, it was destroyed and no longer remains. The construction of the temple at Ranakpur was funded by Darana Shah (*4) in 1439, during the reign of Rana Kumbha of the Solanki Dynasty. Fundamentally this is a type of "Pancha-yatana" surrounded by cloisters, every space is continuous and unified as in the Ranakpur temple. The five shrines are all "Chaturmukha" type having respectively four "Ranga-mandapas" in front of four faces. 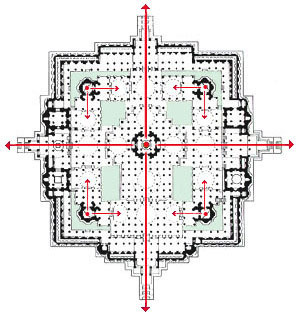 There are greater "Meganada-mandapas" on the crossing axes which connect five shrines, and they continue to "Balanaka" (entrance hall) of four sides. This idealistic plan has a larger scale than that of the temple at Ranakpur. If applied to a normal span, it would become a grand temple that had 100 meters each side. Not to say that it is "Chaturmuka" type that makes this plan possible, it also can be said that this plan is a kind of "Mandala." 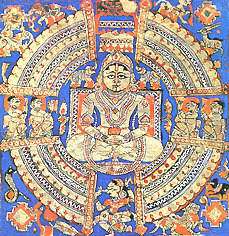 Like Mandala of Buddhism, it could be described as an expression of a cosmology. However, such a large scale of temple has not been built in India. Rather, it was in South East Asia of Indic cultural zone that it matelialized. 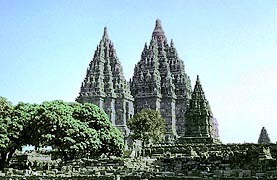 In South East Asia, magnificent temples were projected as Borobudur and Loro Jonggrang in Java (Indonesia), from Phnom Bakheng to Bayon in Khmer (Cambodia). However, it would be Angkor Wat, which was built during the 11th to 12th centuries, that is comparable with the temple at Ranakpur or the ideal plan of Jaina temple, not only in the large scale of the grounds but also in terms of the architecture. PLAN 3. ANGKOR WAT, CAMBODIA, 12th century. from "Angkor Vat, Description Graphique du Temple" by Guy Nafilyan, 1969, Ecole Francaise d'Extreme Orient. 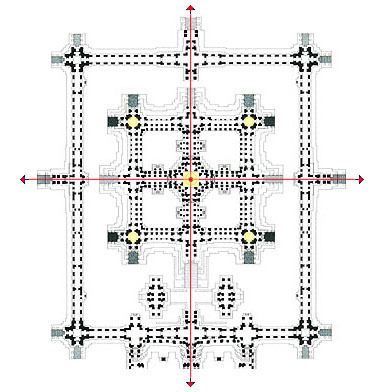 Though this is a plan of inside of the 2nd cloisters, there is a larger 1st cloisters. As the temple is modeled on Mt. Meru, the central part is separated from the 2nd cloisters and on the height of 13m. So the space of central shrine is connected with the 3rd cloisters only. Although the plan is a type of "Panchayatana," it is not "Mandapa" (hall) but linear corridor that connects five shrines. That is the biggist difference from Jaina Temples. 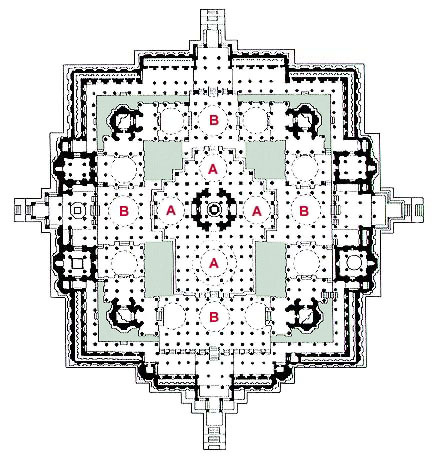 PLAN 3 shows the premises inside the 2nd cloisters of Angkor Wat, and outside this plan there are the 1st cloisters. The scale of the 2nd cloisters is about 100m x 120m (*5) , and the composition has so much in common with the Jaina ideal plan. And we get to know the central shrine of Angkor Wat is also four-faced-type. That is, in making a plan of large-scale temple spreading to its four directions, it invariably requires that the central shrine is the chaturmukha-type. A piece of architecture that mediates the chaturmukha of Jaina temple and Angkor Wat is Somapura Mahavihara (*6), a Buddhist temple built during the 8th to the 9th centuries, which still remains as a ruin in Paharpur, Bangladesh. It is a temple that soars in the center of vast precincts with some 300m x 300m. This temple is clearly a four-faced shrine. Perhaps Buddhists had started to make "Chaturmukha" images influenced by Jaina customs. The oldest one that belongs to the 7th century was excavated in Bodhgaya, a holy place for Buddhists. In Nepal, however, it is considered to have been made much earlier. It seems that originally there used to be a Jaina temple in Paharpur. 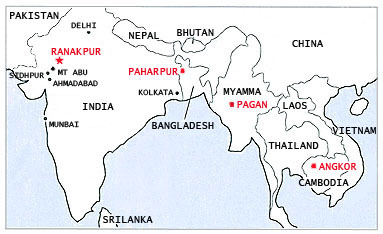 Thus through the temple of Paharpur, which was the only example among Buddhist temples in India that had a plan of chaturmukha-type, this planning method was introduced to South East Asia. 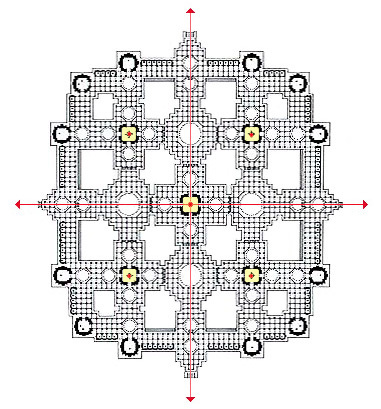 It evolved finally into the plans of Mandala-like large temples in Khmer and Java. Although Hindu temples in India did not develop chaturmuka-type (*7) , tomb architecture in the Mughal Dynasty of the Islamic era often employed this method. Islamic architecture in India has its origin in Persia, and for garden design too, Persian form such as "Chahar Bagh" (Quartered Garden) was introduced into India. Humayun's Tomb in Delhi is situated at the center of a large-scale Chahar Bagh, and naturally takes Chaturmukha form. Originally in Persian gardens, however, buildings surround a garden, not the contrary. The method of setting four-faced building in the center of Chahar Bagh is an application of Indian chaturmukha form to Islamic architecture. That is, they changed the Persian system of four 'Iwans' (half exterior space behind a large opening of pointed arch bordered by square frame) that were opposite to each other around a courtyard into a structure of four 'Iwans' that were combined back to back with each other, turning it into an extroverted four faced shrine form. In this context, we realize that the chaturmuka-type created by Jainas played an important role within Greater India. There are a lot of examples of chaturmuka-type, but considering the richness of space produced by the plan of four-faced shrine, the temple at Ranakpur seems second to none. Then, why was it especially Jainas who developed chaturmukha (four faced open) type shrines? As it is impossible to come up with a complete answer to this kind of question, there is no way but to set up a hypothesis in accordance with its religious doctrine. The hypothesis is based on Jaina logic. In a word, it is "Syadvada" or relativism. Contrary to many other religions, Jainism avoids dogmatism and eliminated self-righteous statements like "This is the very truth." Everything has many aspects, and each religion, doctrine, and statement has a certain sense of truth. Therefore unilateral or absolute judgment about a matter has to be avoided. In making a decision, one should consider that it is right " in the context of certain viewpoint" (syad). It is called "Syadvada." This concept seems quite modern when we look back on the history in which a lot of religions insisted on the validity of their own gods and views of the world, which sometimes resulted in wars. Although there had been a lot of religious conflicts in India in the past and that still continues, Jainas have never committed to military conflict. If every religion took this viewpoint of Jainism, how peaceful the world wouldl become. I would imagine that this relativism was a driving force to develop chaturmukha (four faced) images and chaturmukha-type of Jaina temples. Never assuming one absolute God (Jainism is an atheistic religion), the attitude of regarding even the twenty-four saviors of Tirthankaras (Jinas) as existence that can be seen from multilateral viewpoints made it possible to create chaturmukha images in which 4 statues are placed back to back with each other, and to develop an architectural style of chaturmukha shrine. Basically, I had a strange impression in that Jainas had assumed as many as twenty-four Tirthankaras (Jinas). Is it not enough to have only one founder like Christianity and Buddhism? Maybe it was in order to avoid a personality cult to Mahavira and deny the absolute being that Jainas presumed twenty-three Tirthankaras before Mahavira and provided them with equal values. Being born and developed in India, Jainism has a custom of idol worship. Unlike idols of Christianity, Buddhism and others, however, statues of Jaina Tirthankaras do not reveal distinctive personality. As all statues have similar postures of either standing or sitting, it is difficult to find any difference among them. They would hardly become study objects of art history as sculptural works. To put it extremely, they seem to be nothing but a kind of sign. What is worshipped there is not a personified or divine God such as Christ or Shiva, but the order of the world and various truths of the universe that are expressed in the signs. In this respect, Jainism suddenly unveils its similarity with Islam. They look quite contrary to each other in terms of style, since Islam is a religion of absolute monotheism. Still, the absolute God can be interpreted not as personified existence, but as the order of the universe itself. Likewise, although idolatry is strictly prohibited in Islam, if we regard statues of Jaina Tirthankaras as only signs, the worship of these two religions seem quite the same after all. They both deny the class system; in Islam, "every man is equal" under the God whilst in Jainism, "every living being is equal" under the law of transmigration. Because of the denial of idolatry, painting and sculpture have not developed enough in Islam. Instead, their creative energy in plastic arts has concentrated on architecture. In Jainism, since they have not provided idols with personified expression or narrative character, Jainas have exerted most power into architecture. Similar to Islamic arabesque, Jainas devoted engraving work into carving ornaments within the frame of architectural elements. Perhaps it could be the reason that art historians have not evaluated highly on Jaina or Islamic arts, while an architect like me has been deeply moved by their architecture. To name another example similar to this case, it would be Cistercian monasteries in Europe. Having an antipathy against the gorgeousness of Benedictine abbeys, Cistercians strived to eliminate ostentation in paintings and sculptures. They consequently dedicated themselves to the exploration of architectural composition and the beauty of space. Because of this attitude, they created such monastic architecture as Fontenay in Burgundy and Le Thoronet in Provence, which deeply touch the hearts of architects, contrary to the evaluation by art historians. Jaina architecture, particularly the Adinatha temple at Ranakpur, should be valued in this context. After Jaina architecture attained its peak in the temple of Ranakpur, the development of traditional style of Indian architecture came to an end and has continued to decline since then. The time had shifted to Islamic architecture having come from abroad. Except for South India, even architecture of Hindu dynasties that had kept independence got a strong influence from Islam. In the 18th century, much of the country became a colony of the British Empire. As the fear of temple destruction gradually disappeared, Jainas started to build temples in large cities. A temple that represents this movement was built in Ahmadabad by Sheth Hathisingh, a rich merchant in the city. This temple shows the influence of Islamic architecture by employing a lot of multifoil arches. It also revives "Solanki Style" of medieval period, and traditional techniques of stone sculpture are nicely applied. However, in terms of plan, chaturmukha form, which saw the completion at Ranakpur is abandoned and the style regressed to [garbhagriha + mandapa], which had been used before the temples at Mt. Abu. In Calcutta, there is the Shitalanatha temple that was also built in the same period. This temple is conspicuous in the city that had been developed during the rule of the British Empire. However, the style of the temple which looks like a combination of modern Shikhara-type temple, Mughal palace and Italian Baroque style does not have the grandeur that the Adinatha temple at Ranakpur used to have. It is uncertain how Jainism will continue to exist in the future, but I privately hold an expectation that a contemporary architect like Uttam C. Jain would create a new style of Jaina temple based on chaturmukha form. In "The Penguin Guide to the Monuments of India," vol.1, 1989, George Michell states that the scale of the plan is more than 100m x 100m, but it's incorrect. A scale measured much earlier by Henry Cousens is correct. As the word "Garbhagriha" originally means womb, it can be translated as "womb house." Even though this term implies an image of a dark and deep cave in Hinduism, it is also applied to a sacred chamber of Jaina temples that have an open atmosphere. Siddhapura, presently known as Sidhpur, is located about 230km southwest of Ranakpur. The chaturmukha temple in Siddhapura is said to have been built in the early 12th century. It means this temple was built almost in the same period as Angkor Wat. Saryu Doshi suggests that the name of a contributor such as Dharna Sah, and calls the temple of Ranakpur "Dharna Vihara." The main building of Angkor Wat is surrounded by threefold cloisters. The scale of the 2nd cloister is about 100m x 120m. In Pagan, Myanmar (Burma), the Buddhist Temple of Ananda, constructed in the 11th century, shows a plan of chaturmukha-shrine-type. At the central part of the temple, four statues of Buddha are placed back to back. It does not mean that there has never been a "four faced shrine" in Hindu architecture. There are chaturmukha-type shrines in Payar (11th century) in Kashmir in the north, and in the cave temple (6th century) at Elephanta Island near Bombay in the south. At Eklingji in West India, a statue of four-faced Shiva is enshrined in the Ekalinga temple (15th century), three sides of which are open but the mandapa is placed only at the front side.